1.2 How long does coffee plant take to produce fruits? Coffee is a beverage that is obtained from the roasted seeds of the coffee or coffee plants (Coffea spp). 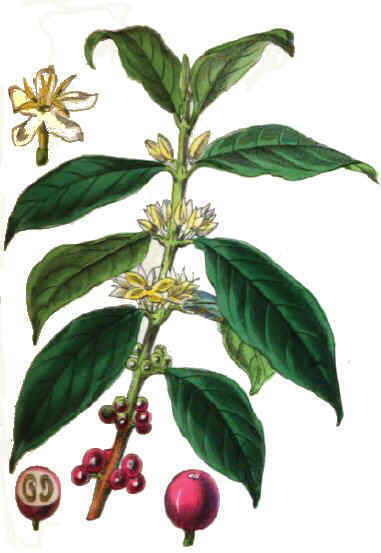 Coffee trees are evergreen shrubs of the Rubiaceae family. They come from tropical Africa, and a fewer species from Asia. Coffee plants have bright green opposite leaves with smooth margins. Its flowers, white, grow in clusters in the axils of the leaves and are aromatic. From them, fruits are born. they are red drupes with the size of a cherry (In fact these fruits are known in many places as coffee cherries). The outside of the fruit is fleshy and inside it there are two seeds or coffee beans, surrounded by a membranous layer of leathery texture, hence this layer is commonly known as the “parchment”. Some species of trees only produce one seed per fruit. In this case the seeds of these varieties are known as “pearl coffee”. The “coffee beans” or seeds are the the part of the fruits that contains more caffeine. These are usually round with a flat face and have a groove or channel in the flat part. When it comes to varieties with a single seed, this is completely round. The reason for this difference is due to the fact that in double seed varieties, the two seeds that grow inside each fruit press each other, so they stop the growth in the part which is in contact, so this becomes flat. How long does coffee plant take to produce fruits? Coffee plants usually produce commercially marketable fruits between 3 and 5 years age. 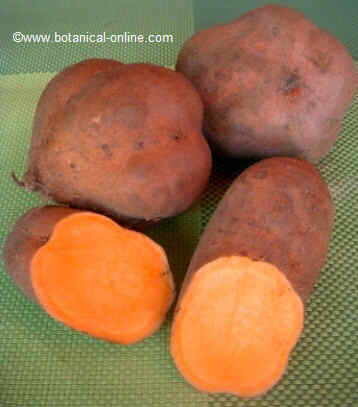 Subsequently, they can be productive for a period of about 15 to 20 years, with average production of each sample of approximately 450 g per year, although there are more productive varieties that can reach more than 1 kg. 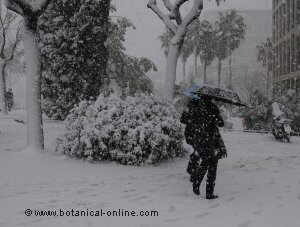 For optimum production cultivated bushes are pruned to reduce its width and height. This is done to further facilitate the tasks of maintenance and harvesting. Before being ready for use, one must remove the outer pulp and papery membrane that covers the seed. 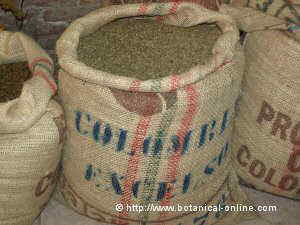 This provides a clean, green seed which is known by the name of “green coffee”. Subsequently, as explained below, this seed is subjected to a series of processes of roasting to obtain roasted black coffee or dark brown coffee such as it is normally sold in establishments. There are approximately 40 species of coffee plants, but the coffee drink is obtained primarily from three plants: The Arabic coffee, robusta coffee and liberica coffee. – The Arabic coffee (Coffea arabica) is a shrub that grows about 12 feet in their natural state, but when cultivated it does not grow more than 4.5 meters. It stands out from a deep root system. Its leaves are opposite, bright green. White flowers, fragrant, jasmine-like odor, are small. 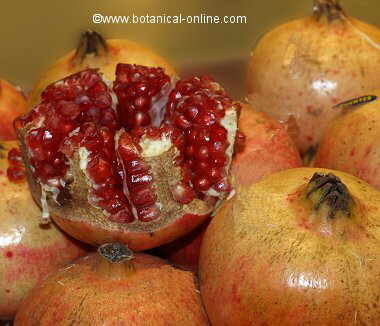 Its fruits, dark green, glossy at first, become dark red when ripe. It seems that this is the first kind of coffee that was cultivated in the world. 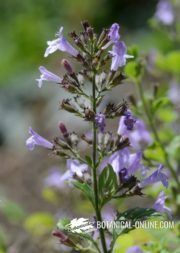 It can also be grown as a garden shrub,where it becomes very decorative because of its evergreen leaves. It is a much more productive plant than the arabica variety (from 2300 to 4000 kg of seed per ha). producing more oval seed from which a coffee with a higher caffeine content (from 1.7 to 4%) and with a more bitter taste is obtained. 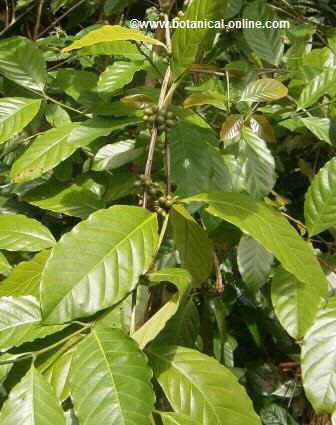 Therefore, the coffee produced by this plant is used mainly for soluble type varieties or blends with Arabica. 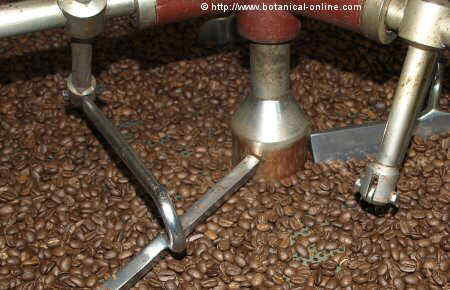 The robusta coffee comes from West Africa but it is grown in many tropical areas of the world. 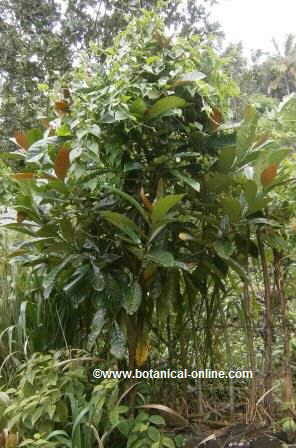 – Liberica coffee (Coffea liberica) is a well-grown tree that can reach 18 m high with large leathery leaves. It produces larger fruit and seeds that provide little flavor. 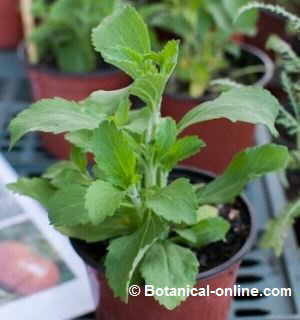 It is used primarily for blending in small amounts with the previous varieties. As its name suggests, comes from Liberia in West Africa but it is mainly grown in Indonesia, East and Central Java Island where it was taken in the late nineteenth century to replace the Arabica variety which had been decimated by coffee rust disease. – Coffee beverage: Coffee plant is mainly used to produce seeds, from which, once they have been roasted and ground,, an infusion is produced, consisting on dissolving it in hot water. Coffee infusion, along with tea infusion, is the most consumed beverage in the world. Besides the seeds in some places, especially the Far East, coffee drinks are made using the leaves lightly toasted. In this case, caffeine content is generally higher than the seed itself. In this way we obtain a type of much cheaper coffee. To realize the importance it plays in nutrition nowadays, it is sufficient to consider the enormous number of black coffees, white coffees, decaffeinated coffees, espressos, instant coffees or whatever varieties of coffee beverages that are drunk worldwide for breakfast or as a snack. – Coffee as medicine: The pharmaceutical industry uses caffeine in the composition of several drugs (mainly analgesics) or as a single drug. in the latter case, it is mainly used to prevent drowsiness in people who work in jobs that require to be especially alert (carriers, taxi drivers, operators of dangerous machinery, etc.) or to speed up the metabolism in people with fatigue. 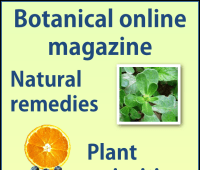 – Coffee in gardening: The coffee remains can be used as fertilizer for plants. 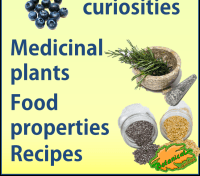 They contain many minerals, especially nitrogen, phosphorus and potassium, thus facilitating the growth of plants. Using leftover coffee to water the flowers or as a fertilizer is a good way to get better plants. Larger amounts of leftover coffee can be obtained from coffee shops or big cafes. The remnants of coffee improve the composition of the compost. Coffee is one of the world’s most important crops, given the high number of people living directly or indirectly from it. It is estimated that there are more than 6000 million kilograms of coffee per year and over 120 million people depend on it. One should keep in mind that this crop is the main source of income for many developing countries. The two largest world producers are Brazil, which produces nearly a third of world production and the production of which employs some 3 million people, and Vietnam where production has increased greatly in recent years. Colombia is the third largest producer. Indonesia, Ethiopia, India, Guatemala, Mexico, Peru and Uganda are also big producers. The world’s largest exporters are Brazil, Colombia. The main importing countries are USA, Germany, Italy, Japan, France, Canada, UK, Spain, Russia, Netherlands and Sweden. More information about coffee and caffeine.